Far more drivers are choosing the I-405 express toll lanes than expected, bringing in so much revenue that the state says it has the money now to convert a highway shoulder to a traffic lane. A project to add a traffic lane and bring relief to one of the worst choke points on Interstate 405 will start sooner than expected, state officials said Wednesday, noting that unexpectedly high toll revenues gave them the necessary funds. On the Highway 527 onramp to northbound Interstate 405, Gov. Jay Inslee and state transportation officials said the $10 million paid by drivers since the express toll lanes opened last year makes the expedited schedule possible. For 1.8 miles north of the onramp, the shoulder will open to traffic during rush hour. When the lane would open was not announced. Far more drivers are choosing the express lanes than expected. In the opening months, revenues tripled Washington State Department of Transportation (WSDOT) forecasts. “There’s been about 7 million trips. … They’ve actually decided the best thing for their lives is to make that investment,” Inslee said. The lanes allow solo drivers to buy a faster trip by paying to enter the bus-carpool lane. Tolls vary, based on congestion, to maintain a 45-mph flow. People pay up to $10 to enter the fast lane. 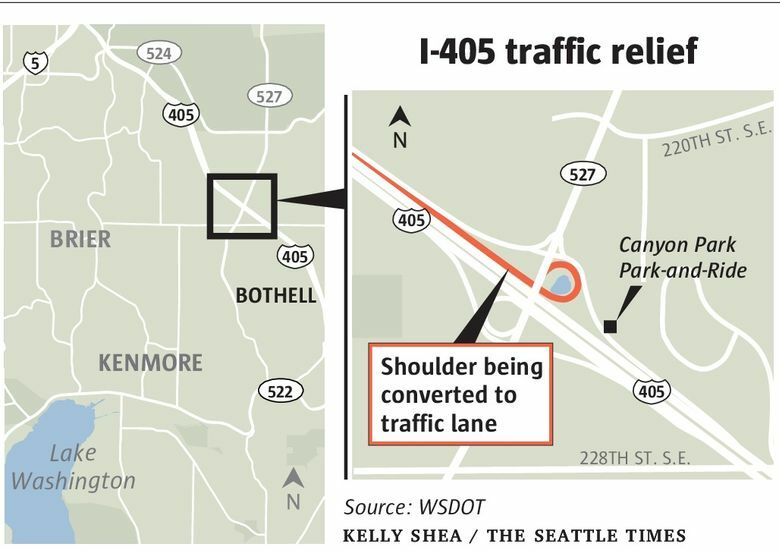 By law, toll proceeds must be reinvested in I-405. The project was part of a 2002 state master plan. The toll money will allow construction to begin around six months earlier than expected. Kim Henry, I-405 program director for WSDOT, estimates roughly 1,000 cars contribute to the bumper-to-bumper traffic created by the ramp just in the peak hour of traffic. Inslee, Bothell Mayor Andy Rheaume and WSDOT officials watched the traffic worsen from the bridge over the highway at the Canyon Park Park-and-Ride around 3:30 p.m. Wednesday, and then made the announcement. The project, which will cost $11.5 million, will use all the revenues from the express-toll lanes.